It’s a fact; Singaporeans love their online shopping. With local e-commerce powerhouses like Zalora and Luxola, as well as international platforms like Taobao and Amazon, we’ve got a wealth of choices that keep us shopping on our desktops and mobiles. In fact, e-commerce revenue in Singapore is expected to reach an all time high in 2015 of 4.4 billion! Thanks to this, the need to improve on logistics is at the forefront of Singapore’s tech startup space. And the latest player to enter this space is tackling a very specific need. Imagine this: you’re expecting personal packages, but deliveries take place only in the day when no one is at home. Getting them delivered to your office may also be out of the question, especially if your company has a policy against personal packages. You then start looking for companies that support late night deliveries, even trying to personally request it, or risk getting missed delivery notes and having to find another way to get that package. 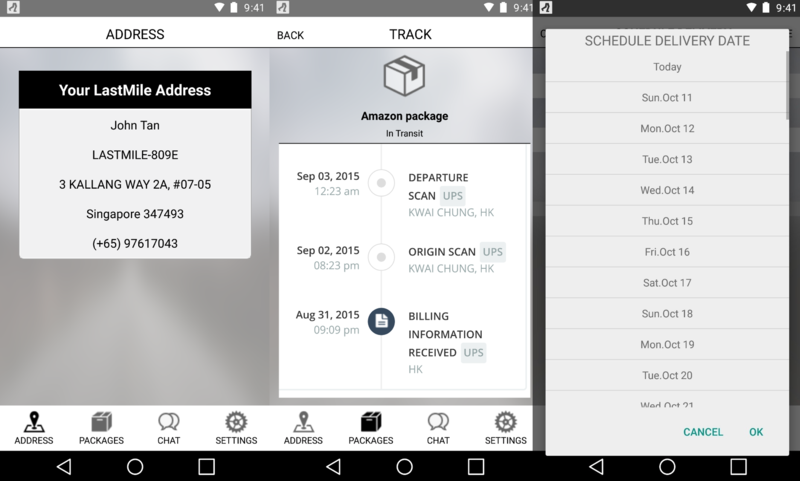 LastMile, a logistics service started in Singapore by Leo Kwek, aims to solve this issue. The company essentially works as a go-between, offering to hold your products and deliver it at a more preferable time. How it works is pretty simple: upon signing up with the app, it offers you an alternative address where you can send your packages. You can then consolidate your purchases, and LastMile will then deliver everything to you at your stipulated time slot, which can go as late as 12 midnight. Probably the best thing about this service is that you can arrange for same-day delivery, so there won’t be any added waiting time for your packages. According to Leo, the sole founder of LastMile, the logistics services available in Singapore are not accommodating to this need yet, and his service can meet this need. “When it comes to last mile logistics, there isn’t a single delivery company that provides a mobile app as a platform to allow users to track their packages, keep track of their online purchases, schedule and reschedule delivery date and time easily,” said Leo. The collection point lockers idea is definitely a current favourite for many users, with the SingPost POPstations being adopted by many e-commerce services like Qoo10, Rakuten, and even smartphone producer Xiaomi. LastMile brings to mind a much smaller scale of BorderLinx, a service that gives you a designated US address and provides global shipping for US-only products. It’s a tried and tested service that has proved to work, but in Singapore alone, it seems to cater to a very small market with a very specific problem. Singapore’s logistics scene is rife with alternatives, and while nothing large-scale has been done to solve this problem, there are solutions that logistics companies and even e-commerce platforms are moving towards. Late-night shipping is one of them, if popular e-commerce provider Luxola is anything to go by. The service is currently free to use for the first two months, which may help warm users up to the idea. But when it reverts back to its official cost of $5 per package, it brings to question how willing Singaporeans will be to pay for the service, as compared to driving a few minutes to a POPstation. So is niche logistics really a good market to go into? Probably not, in a small city like Singapore. Leo shares that LastMile is looking to expand to neighbouring Southeast Asia cities like Kuala Lumpur, Bangkok, and Jakarta, where the service will definitely gain traction. In the long term, their biggest danger is that e-commerce platforms will simply offer late-night deliveries on their own accord. But in the short term, they may be busy and lazy Singaporeans’ best friend.